Rohde & Schwarz is an inaugural participant in the program with the R&S CLIPSTER mastering and distribution workstation. With IBC 2018 approaching, Netflix has launched its Post Technology Alliance program. 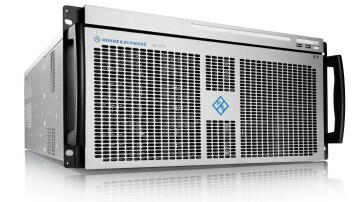 Rohde & Schwarz is an inaugural participant in the program, with the R&S CLIPSTER 6.7 mastering and distribution workstation, which is used in the post production and delivery of many Netflix original productions. The Post Technology Alliance program identifies products that meet Netflix technical and delivery specifications today and will continue to do so in the future. Netflix’s post production partners can rely on tools bearing the Post Technology Alliance logo. Netflix evaluated and tested R&S CLIPSTER version 6.7 before accepting the system into the program. Rohde & Schwarz collaborated with Netflix engineers to ensure the workstation fulfills all of its technical and workflow requirements and is committed to product innovation and customer service support. The IMF creation process is evaluated – from tool development and use in post production to the delivery of content to Netflix. As a participant, Rohde & Schwarz has access to Netflix’s evolving roadmap and engineering resources so they can develop tools that have the latest features ready when they are needed. Post production partners can be sure that the tools they use meet Netflix’s specifications. Plus, they have access to enhanced documentation, training and support. The R&S CLIPSTER workstation sets the standard for mastering and distributing feature films and episodic TV. It provides a foundation for post production vendors to build services upon. R&S CLIPSTER can support a wide array of professional media file formats or baseband SDI up to 4K 120p during various stages of post production with its built-in tools. R&S CLIPSTER can perform conforming, VTR emulation, nonlinear editing, real-time video processing, advanced color format transformations, and even help operators achieve reliable delivery with output wizards for a myriad of professional formats. R&S CLIPSTER can generate digital cinema packages, Interoperable Mastering Format (IMF) packages and AS11 and AS02 packages, providing excellent quality, reliability, and performance. In addition to the creation of files, R&S CLIPSTER also provides robust video playback for QC, review, and approval as well as playout to tape via SDI, DisplayPort and HDMI with 16 embedded SDI audio channels or 16 AES/EBU channels.